Make video mosaics -- movies assembled from movie clips. Is there a better alternative to Mazaika-Video? Is Mazaika-Video really the best app in Video category? Will Mazaika-Video work good on macOS 10.13.4? Mazaika-Video needs a review. Be the first to review this app and get the discussion started! Mazaika-Video needs a rating. Be the first to rate this app and get the discussion started! 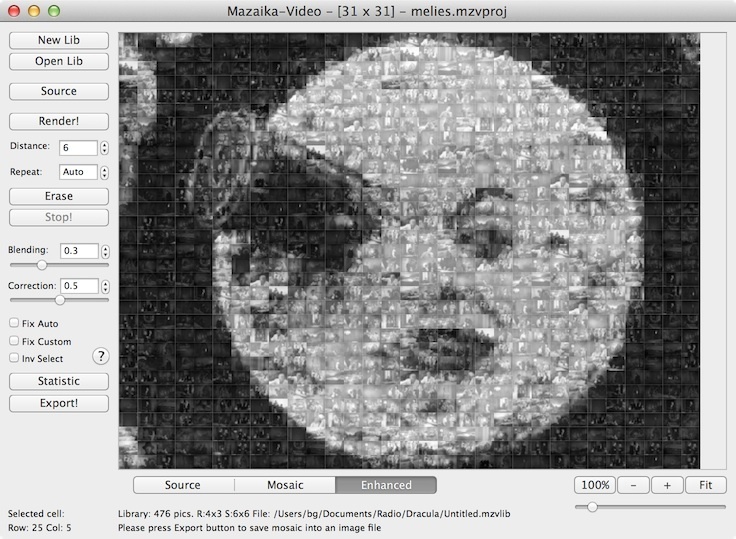 Mazaika-Video creates video mosaics: a photo mosaic made from movie clips. As you know, photo mosaics are pictures assembled from still images. In the case of video mosaics, every single mosaic cell contains a video clip. When all these clips play together they form a single picture. Mazaika-Video does complicated computations to produce very spectacular works of art. The Mazaika-Video software package contains the Mazaika-Video program itself and three additional utilities for converting video into series of still frames and converting separate still frames into common-format video files. If you want to make your own video mosaic, please download free trial of Mazaika-Video package and see how it works for you.